The Greek parliament has approved new harsh austerity legislature needed to secure a 130-billion-euro bailout from the EU and the IMF in efforts to avoid devastating default. 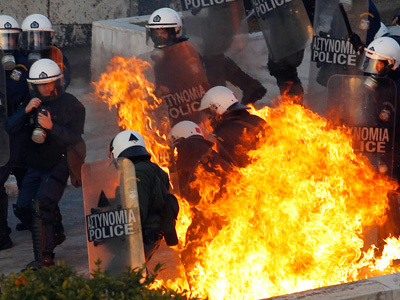 This comes amid violent riots against the vote in Athens. ­The lawmakers voted early Monday in favor of the bill that will cut 15,000 public-sector jobs and lower the minimum wage by 20 per cent. Out of 278 MP's, 199 voted in favor of the bill, with many of those who rebelled being expelled from their parties. 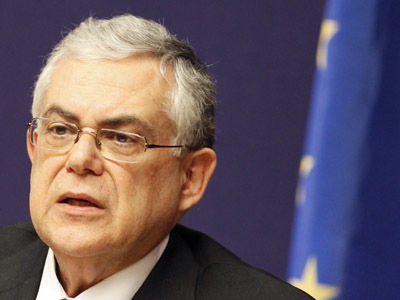 Before the voting began, Greek PM Lucas Papademos stressed the crucial importance of the measures warning of “uncontrollable economic chaos” if they were not passed. “The social cost of this program is limited in comparison with the economic and social catastrophe that would follow if we did not adopt it,” he said in a televised address. 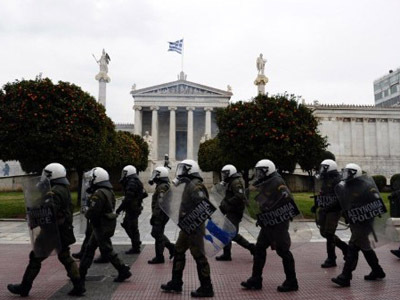 More than 100,000 protesters marched to the building of parliament at Syntagma Square on Sunday to express their anger at the new harsh austerity bill. 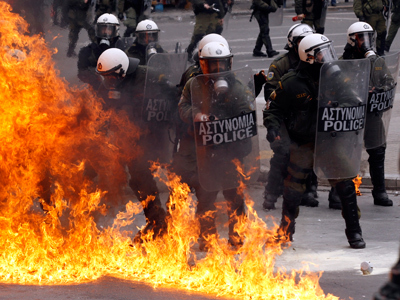 Demonstrators have clashed with police, setting buildings ablaze on their way in central Athens. Dozens of police officers were injured and at least 55 protesters were sent to hospital. Police said 150 shops were looted in the capital and 34 buildings were set on fire by enraged mobs. A three-story corner building believed to be a home appliances store was severely damaged by fire. Among other buildings damaged were a cinema, a bank, a mobile phone dealership, a glassware shop and a coffee shop, the Associated Press says citing the fire department. 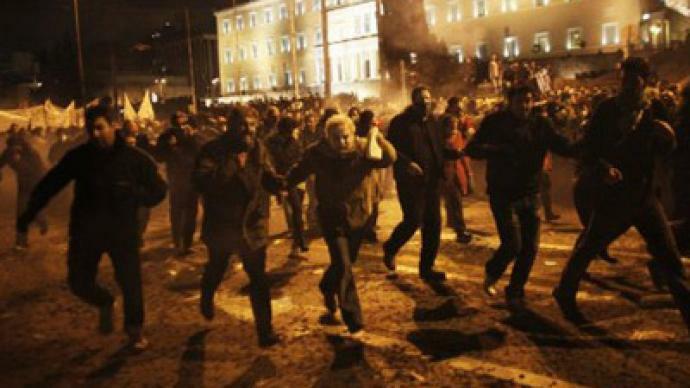 Greek journalist Eirini Zarkadoula described Sunday as the worst day of violence since the 2008 riots, when a student protester was killed by police. “People are really angry and we expect more violence,” she added. The austerity measures were demanded by Greece's international creditors, in return for a second 130-billion-euro bailout. Athens needs the cash to pay off interest on its massive debts, to keep its rapidly shrinking economy from defaulting. However, a former Belgian MP and international consultant Lode Vanoost believes that the EU’s intentions are far from saving the Greeks in the first place. The EU wants to save the euro, while carrying out a social experiment on Greece.